On Tuesday night, Pat Hartman asked his wife of seven years out on a date. "I said, 'Let's go out to eat, how about Padrino's?" the South Florida man said. It's a good thing she said yes. They enjoyed a dessert of bread pudding, on the house. A free sweet, just for taking out his sweetie. It is one of several dates the Hartman's have committed to going on. They do it at least once a week, thanks to an app that challenges couples to rekindle their romance. "It's kind of your phone reminder to date," said Patricia, Hartman's wife. Life can often get in the way of dating and Patricia Hartman should know. As a forensic CPA, she works with clients who've stopped dating altogether and are filing for divorce. "You just hear over and over the same things: they're not connected, they grew apart," she said. Florida reportedly has the 8th highest divorce rate in the country. While that's nothing to brag about, South Florida's endless number of romantic hotspots is. That's where datenightflorida.com comes in. 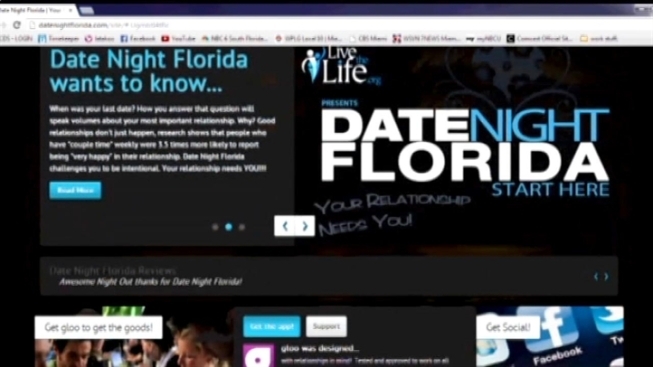 "Date Night Florida is here really just to set up a parameter, an easy blue print so couples can get their date on with the person they love the most," said JP Hervis, a spokesperson for the website. You can take it with you on your phone by downloading the free "Gloo" app for the Iphone or Android. "You push on Broward and all the restaurants and items come up and there are 16 things on there for you to do," said Pat Hartman, who's now an expert date planner. They chose Padrino's Cuban Cuisine in Plantation, which offered a coupon for a free mojito or dessert. "Maybe I wouldn't be thinking about having a mojito or even going out to dinner on a Monday or Tuesday night. This is a midweek date you wouldn't have had otherwise," said Laura Padrino, Padrino's marketing and creative director. For the Hartmans, date night after marriage is even sweeter. They topped off a great date night with a kiss after splitting their bread pudding.